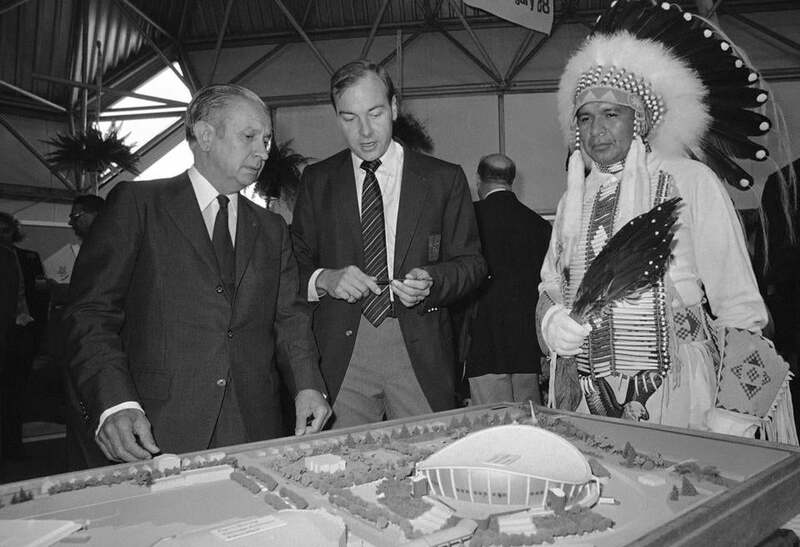 IOC president Juan Antonio Samaranch (left) with Frank King and Canadian native Lombart Fox and Canada’s model. CALGARY, Alberta — Frank King, an architect of the 1988 Winter Olympics that helped change the face of Calgary, has died. He was 81. He died Wednesday of a heart attack while training at a downtown club, said Bob Niven, the chief executive officer of Calgary’s bid committee. Mr. King was an avid runner who competed in the Seniors Games. Mr. King was the CEO of the organizing committee. In the effort to bring an Olympics to Calgary, Mr. King and Niven had to overcome the reputation of the money-losing 1976 Summer Games in Montreal. Canada is now a winter sports powerhouse, with Calgary a training hub for the country’s Olympians and Paralympians. Canada won just five medals and no gold in 1988, but it captured 29 medals, including 11 gold, at this year’s Pyeongchang Olympics. Mr. King and Niven were members of the Calgary Booster Club in 1978 when the club president asked if anyone was interested in bringing a Winter Olympics to the city. ‘‘Frank and I just sort of smiled at one another and put up our hands and that was the beginning of it all,’’ Niven told The Canadian Press on Thursday. The Olympic Oval, the Saddledome, Canada Olympic Park and the Canmore Nordic Centre in Canmore are still used for the purpose for which they were built. That success is now the foundation for Calgary’s possible bid for the 2026 Winter Olympics. ‘‘Our medal count has gone up tremendously as a result of the facilities and programs that were put in place as a result of the ’88 Games,’’ Niven said. Calgary was an oil town with a population of a half million people in 1978. A Canadian city had never hosted a Winter Olympics before. In addition to the problems with the Montreal Games, Calgary was burdened by Canada’s decision to join the boycott of the 1980 Summer Games in Moscow. The Calgary Games were the first to run 16 days instead of 12, the first to pull in a large television contract that ultimately made the games profitable, and set a standard in volunteerism. Mr. King was named an officer of the Order of Canada in 1988 and received the Olympic Order in Gold from the IOC that same year. He served as a director for the 2010 Winter Olympics in Vancouver and Whistler, British Columbia.